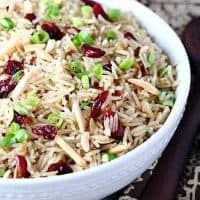 CRANBERRY ALMOND RICE PILAF — Savory rice pilaf with cranberries, toasted almonds and green onions. Perfect as a holiday side dish! 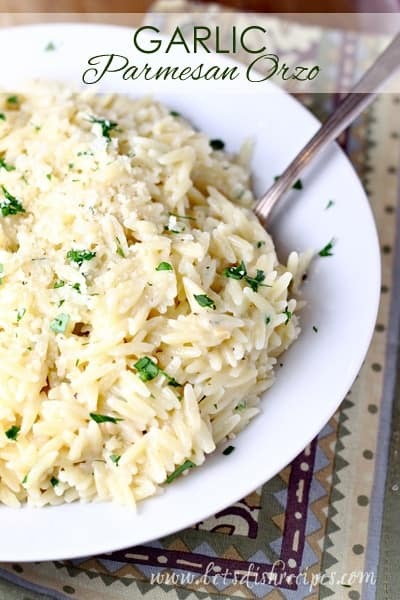 Rice is such an economical side dish, and one that my boys all love, so I’m always looking for new ways to prepare it. This Cranberry Almond Rice Pilaf is easy enough for an every day dinner, but fancy enough for holidays and dinner guests. The festive colors make it the perfect side for a Thanksgiving or Christmas dinner, and I love the mix of textures and sweet and savory flavors. The cilantro is surprisingly good in this dish, but you could certainly substitute other herbs if you’re not a fan of cilantro. Parsley would be great! And pecans, or even cashews would also be good in place of the almonds. Dried cherries or even apricots would also be delicious substitutions for the cranberries. I love a dish that’s versatile like this one, because it allows me to use up what I have on hand. And it really doesn’t take much longer to make than plain old rice. 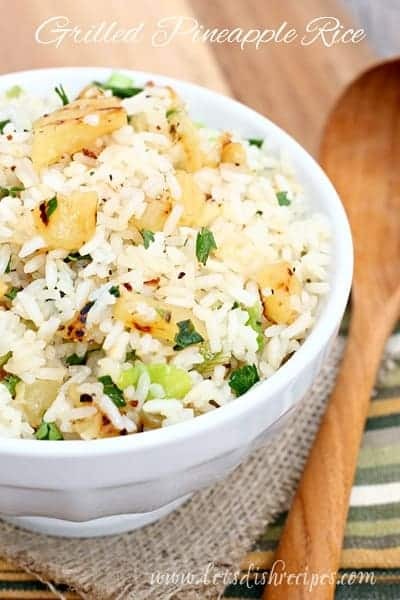 My husband isn’t usually a fan of fruit in savory dishes, but he always goes back for seconds when I serve this rice for dinner. Of course, you don’t have to toast your almonds, but it adds so much flavor. Besides, what else are you going to do while your rice is cooking? I think this would be even better with brown rice, but my family disagrees, so I usually make it with white. Although I most often make this during the holidays, it’s a wonderful side dish any time of year! 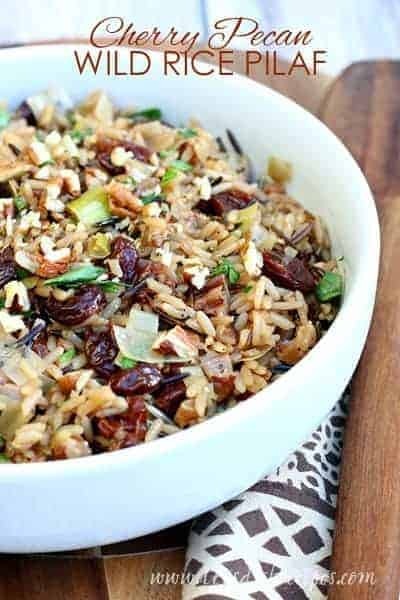 Be sure to save this Cranberry Almond Rice Pilaf recipe to your favorite Pinterest board for later. Savory rice pilaf with cranberries, toasted almonds and green onions. Perfect as a holiday side dish! Heat olive oil in a large skillet or saucepan over medium heat. Add onion an cook until tender, about 5 minutes. Add cranberries and rice to pan and cook about 5 minutes more, stirring often, until rice is lightly toasted. Pour chicken broth into pan and season with salt and pepper, to taste. Bring rice to a boil over high heat, then cover and reduce heat to low. Simmer until rice is tender and liquid is absorbed, about 22-25 minutes. Remove pan from heat and stir in green onions, cilantro, and toasted almonds. Season with additional salt and pepper, if needed.